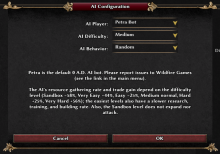 ⚙ D1749 Update AI difficulty level description. Authored by Nescio on Jan 15 2019, 4:07 PM. 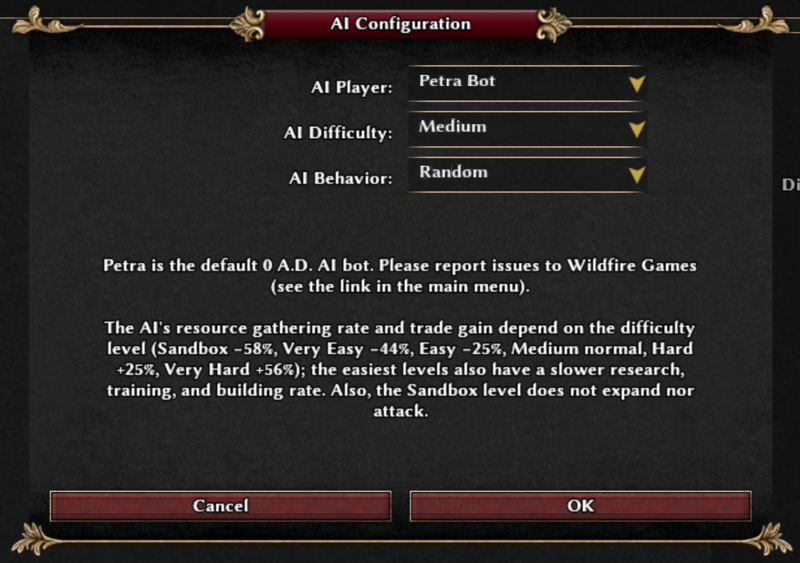 rP22056: Update AI difficulty level description. 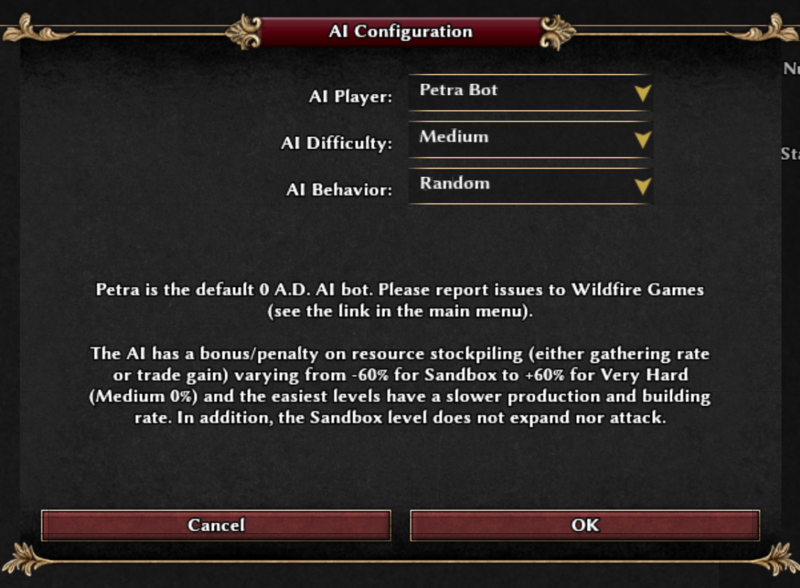 When you are about to start a match and open the AI Configuration option, the description says the AI's resource stockpiling is −60% for Sandbox and +60% for Very Hard. Those values are actually incorrect. Presumably it was forgotten to update this description the last time the rate was tweaked. 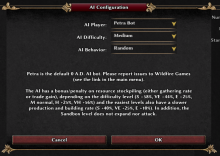 This patch updates the description by listing the actual numbers for all difficulty levels. Last time the values were changed in rP21256. In rP21257 the description was adapted. So it was adapted. But it has been rounded. So not sure if we should use exact values, but I have nothing against it. I don't find your new format that readable. I think the old had enough information. Yeah acronyms like this might be a bit annoying to translate and I'm not sure a neophyte would get it. I'm ok with both versions. 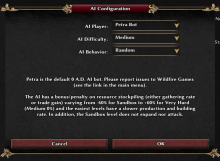 The purpose of user-facing text is to convey information to the player. Listing the values for all difficulty levels is desirable, because currently the only way for players to figure out the numbers is by looking up the InitGame.js file, something which ordinary people won't do. 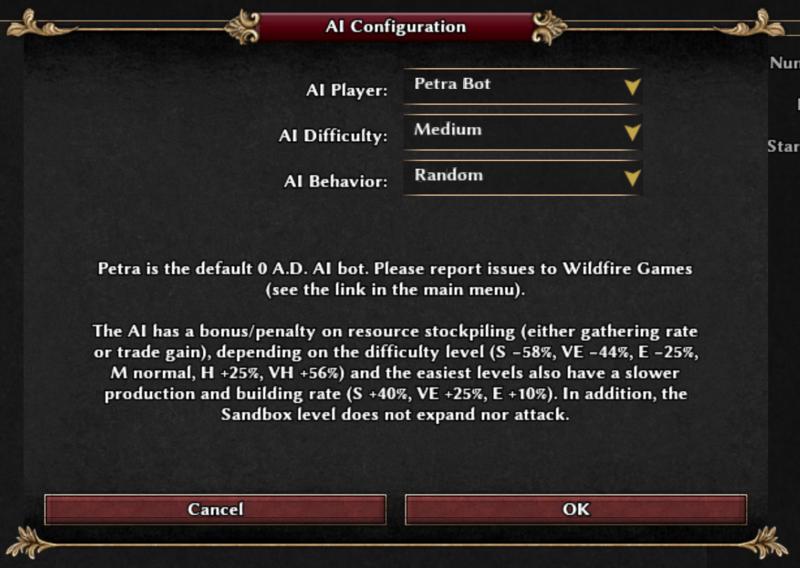 Besides, new players are more likely to play Medium (default) or Easy (because of name) rather than Sandbox (boring) or Very Hard (daunting), therefore displaying only the numbers for the highest and lowest levels is not really the most useful. Yes not a very strong objection anyway, go ahead. Shouldn't it be . The easiest levels? are all correct; the interpunction is a matter of personal taste. It can be changed, if you like. the interpunction is a matter of personal taste. It can be changed, if you like.